bucket of dirt plus thorny vegetation with each hand). By the time I got home I was hot and tired. After drinking a nice big cup of something icy, I headed down to my garden revved up on peanut butter cookies. I had a flat of veggie starts, some seeds, and the determination to get some stuff in the ground before dark. Sorry, I didn’t use any strings to ensure that my rows were straight, just my hoe. My plan was vague, but I did factor in rotation of the potatoes and tomatoes from last years location. 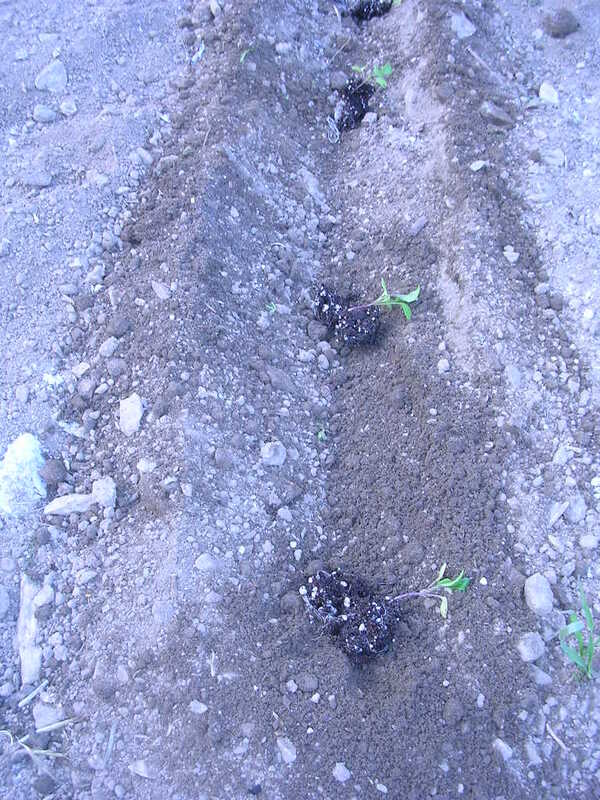 I started off planting leeks and arugula with the hope that they might deter the hungry groundhog that shows up every year…the first day he tentatively nibbled the plants, the second day he ate all the brassicas and lettuce down to the ground. He avoided the arugula completely. I wasn’t 100% sure it was a groundhog, until I saw him merrily skipping around the neighbor’s garden with no fear and complete abandon. pulled them apart to plant individually. They looked like green hairs laying on the ground. I did the same with the arugula, getting way more baby plants than two people could possibly eat. 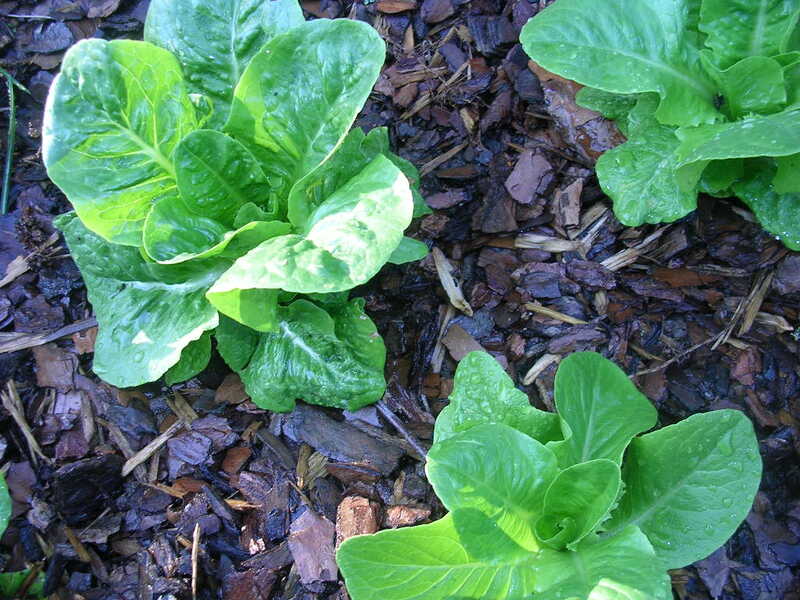 Then, on to sugar-snap peas, broccoli, red cabbage, collards, lettuce, spinach, & mesclun mix. I humped up the ground with my hoe to make a raised bed for Purple Haze carrots; they’re purple on the outside and orange in the inside. Psychedelic. Can’t wait to pull one up and taste it. 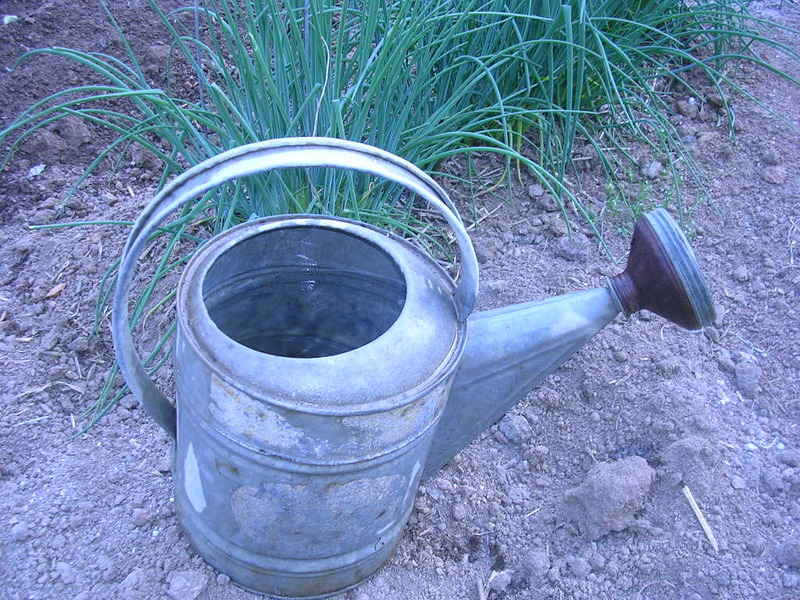 In near dark I watered everything before calling it quits, which meant hauling the water in my grandmother’s patched-with-duct-tape watering can, and numerous trips back uphill to the faucet. Rain barrel time! After another day (today) of hauling roses around the nursery, an icy after-work drink, and the last peanut butter cookie ~ I headed down to the garden with my full watering can. Even though I watered this morning before work, following such a hot & sunny day; the leeks were flat on the ground, and some of the arugula looked crispy. I gave everything a drink or two (read 7 trips back and forth from the faucet with my watering can). I hope the groundhog won’t show up! Moral of the story: It may not be perfect, but just do it!